For gardeners and homeowners in the Maryland-DC area, winter doesn’t have to mean sterile white, dead gardens. There are many plants you can add to your winter landscape that bloom in winter – even in our area! Now is the perfect time to look around your garden and think about ways to bring color and texture to your winter landscape. Here are some perfect outdoor plants for winter landscaping in DC and the Bethesda, Maryland area. Contact us for a free evaluation of your gardens! Mahonia: Leatherleaf mahonia (Mahonia bealei) and selected cultivars of M. x mediaprovide a yellow bloom and berries that birds enjoy in winter. 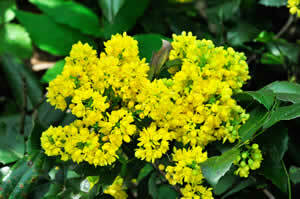 Also known as Beale’s barberry, mahonia is a prickly plant that has become more invasive in warmer climates. The shrubs can grow to 8-12 feet but can easily be maintained at a 6-foot height. Best location is in a security perimeter or at least away from sidewalks and walking paths. A close relative, Oregon grape holly, is more winter hardy. 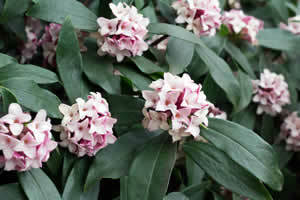 Daphne Bholua: The ‘Jacqueline Postill’ variety is the most popular of this species that was introduced to the West out of Nepal. 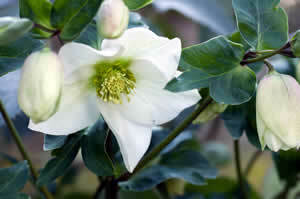 The fragrant, white blooms appear in midwinter, while fully cloaked in handsome narrow, wavy, deep green leaves. 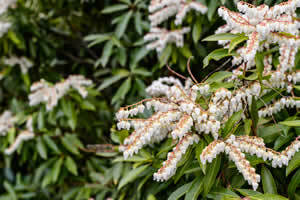 Lily-of-the-Valley Bush: Pieris japonica produces drooping clusters of delicate white blossoms that burst from pink buds in winter and spring. This Japanese transplant is a neat, rounded shrub that can grow to 12 feet tall and 10 feet in diameter. Christmas Rose: Helleborus niger is one of the easier garden plants to grow and blooms through the darkest months of the year. This evergreen perennial sports a 2- to 4-inch white bloom, sometimes tinged in pink. They do best under deciduous trees as they enjoy the summer shade and winter sun. 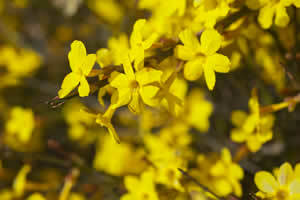 Winter Jasmine: Jasminium nudiflorum is a vining shrub that can be trained up a trellis. However, it is more appealing cascading over a retaining wall or tumbling down a bank or hillside. Hundreds of bright yellow flowers open along the stems in the dead of winter. 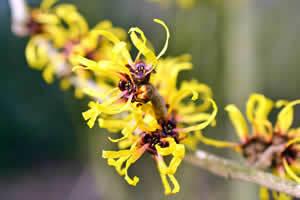 Witch Hazel: Five varieties are available with sweet-smelling flowers in reds, oranges and yellow. The ‘Jelena’ variety blooms in a coppery orange color as early as January plus offers a red-orange foliage in the fall. 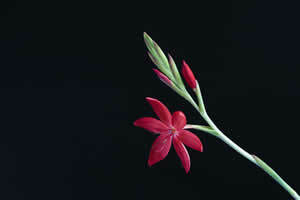 Red River Lily: Also known as Kaffir lily, normally blooms in fall but the bright red blooms can reappear during mild days through midwinter. Bark: Though your deciduous trees will lose their leaves in winter, the remaining bark and branches can draw attention. The dark, reddish-brown bark of flowering dogwood trees also provides great texture with its square-like plates. With its light color, birch trees also add a lighter contrast and the peeling nature gives a fun texture. Evergreens: Just as the name states, these trees and shrubs give your garden a constant green through the winter. Plus their boughs provide a scenic wonder when draped in snow. And the many varieties mean you can plant for varying heights and density to meet the needs of any part of your garden. Ornamental Grasses: Leaving your ornamental grasses in place during the winter gives another option for appeal. The tans and oranges provide beauty when coated in snow or give a sense of motion when waving in the winter winds. Looking around your garden while it’s green and lush, think about what’s going to be long gone (or dead) by wintertime. Are there areas of your garden that will become completely barren that aren’t suitable for any of the winter plants you’ve considered? This might be a good place to consider something more structural, such as an arbor, a bench, a trellis or even a garden sculpture. Planning such a project in the summer will have you prepared to start the work in the fall and have the piece in place by winter. You won’t want to just plop down some new piece. You need to think about how you can create beds around the piece, how paths can bring you there, what types of new plants to add in the fall and spring to complement it. This is also a good time to consider upkeep on structures in your garden. You might even give some of your current pieces an upgrade that will be appealing during the winter months. Decks could use a fresh stain. You could change out an aging wooden rail for a brand-new metal railing to provide a more upscale look. Or add a splash of color to an existing piece to make it stand out in the winter gray and white. Up-lighting trees, lining walkways with soft yellow light, turning patio containers into light beacons are some ways you can add interest in the dark evenings of winter. Once the holiday lights become passe, you still can embellish your landscape with subtle lighting that penetrates the dreary darkness. Solar lighting makes this easier with no need to string electricity across your yard. If you live in the Bethesda, Maryland or Washington DC area, please contact us to start making plans now to transform a potentially dreary landscape into a winter wonderland. Whether it’s building a new gazebo, launching a planting program or just tweaking your already luxurious landscape, our designers will help you craft the best solution for your home.